Great entertainment is the difference between a monotonous flight and one that goes by in a flash. So while economy seats are shrinking and airline fees are ever flourishing, it’s nice to know that the airline industry’s entertainment offerings, as a whole, continue to steadily improve. The following 10 airlines offer some of the most advanced, unique, and high-quality in-flight entertainment offerings in the industry. 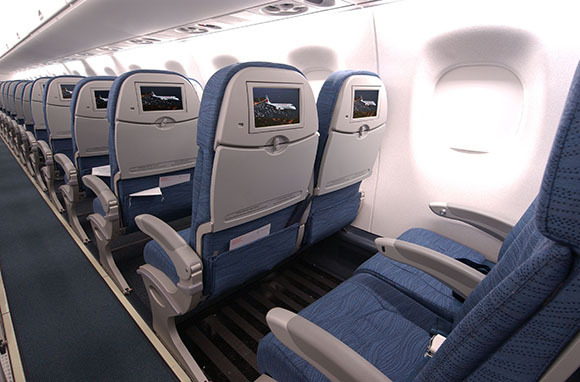 For a major North American airline, Air Canada offers an impressive selection of free entertainment choices on its touch-screen seatback systems; these are complimentary as well as consistently available on all Air Canada-operated flights. And last spring, the airline upped the ante. Air Canada expanded its in-flight entertainment options to offer twice the number of movies that were available previously. Flyers will now find 150 movie choices on international flights and 63 options on North American flights, all for instantaneous watching on seatbacks. 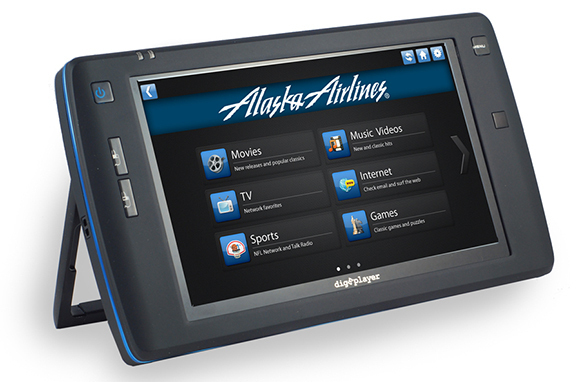 Plus, passengers can summon TV series, music albums, and 12 channels of satellite radio, all with the tap of a finger. Emirates has snagged the Skytrax award for in-flight entertainment for eight consecutive years. And we're not exactly surprised. 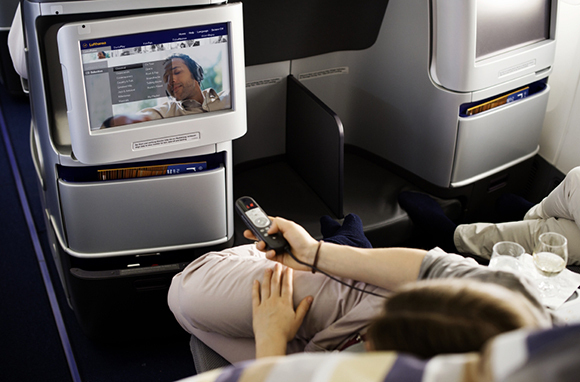 The Dubai-based carrier takes airborne diversions quite seriously, as is evidenced by its exhaustive collection of movies, music, and more, available on Ice Digital Widescreen, its in-flight entertainment program. (It was also the first airline to install seatback screens on every plane in its fleet, back in 1992.) According to a representative from the airline, flyers can choose from "over 1,400 channels of entertainment from around the world, plus thousands of music tracks, from contemporary to classical." 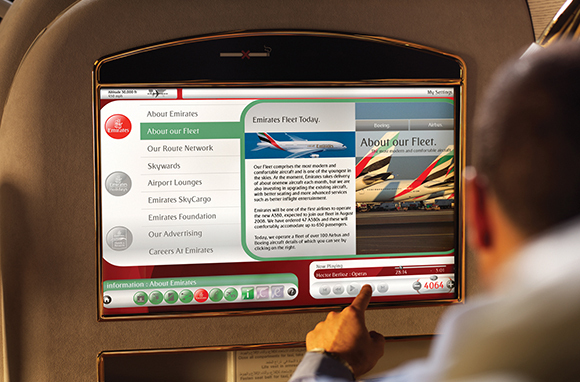 Passengers on Emirates can also toy with 12.1-inch seatback screens, the biggest in coach class. 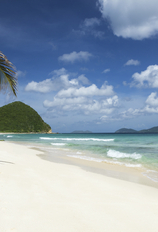 JetBlue's revolutionary entertainment offerings scored the budget carrier a spot on this list. According to a representative for the airline, "JetBlue was the first commercial airline to offer live in-flight television. A decade later, we still offer 36 channels of television and 100 channels of SiriusXM satellite radio on every seatback for free." 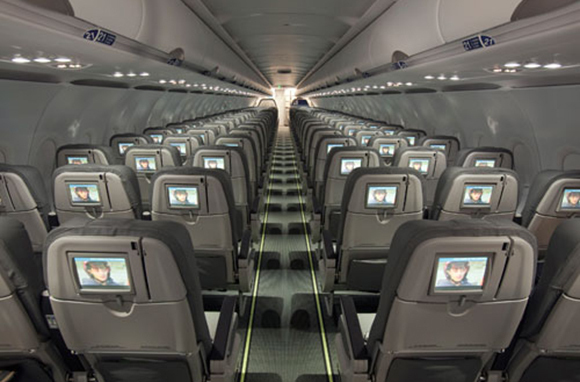 DirecTV is available on seatback screens fleet-wide. Moreover, JetBlue is gearing up to give flyers something virtually unheard of in domestic flying: Wi-Fi that actually works really well. In 2013, the airline will roll out complimentary yet super-fast Wi-Fi for its whole fleet, with an average page load time of 10 pages in one minute and 18 seconds. (Not a bad connection speed for a metal tube hurtling through the sky at 30,000 feet.) 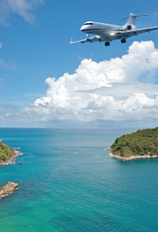 Read more about JetBlue's improved in-flight connectivity here. 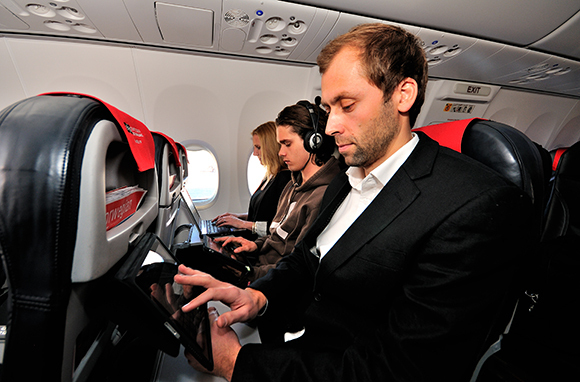 This year, Norwegian won the APEX award for best in-flight connectivity and communications. Why? Well, mainly because of three words rarely heard in the airline industry nowadays: totally free Internet. Most of the carrier's Boeing 737-800s are hooked up with complimentary Wi-Fi in the sky, which is enabled when planes hit an altitude of 10,000 feet. The airline's working to offer Wi-Fi on its entire fleet by the end of this year. 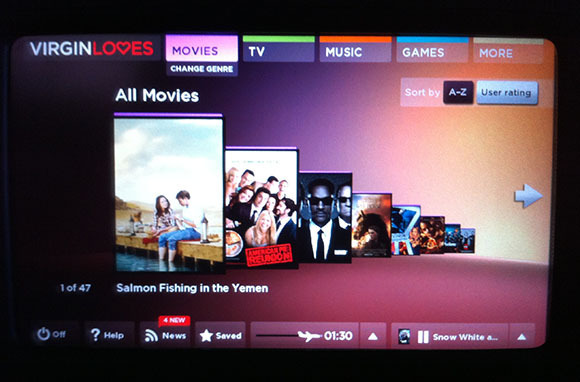 Additionally, Virgin Atlantic's JAM touch-screen entertainment system is similar to the award-winning Red on its sister airline, Virgin America. Passengers get an iPad-like console with unique features such as the ability to rate movies (on some flights) and even audiobooks, including Fifty Shades of Grey. No judgment here. We also have to give Southwest credit for thinking beyond the small screen. As part of a promotional program called Live in the Vineyard, the airline has been holding live concerts on select flights. 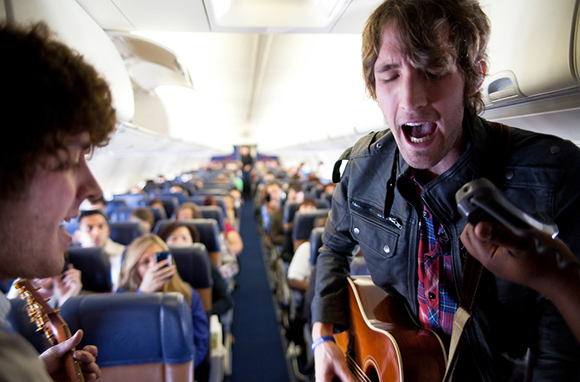 Through early November, musicians will make appearances on select Southwest planes and play a few songs through the P.A. system. Singapore flies some very long-haul routes. The airline's trip from Los Angeles to Singapore is actually the world's longest direct flight, covering more than 10 time zones and lasting longer than 18 hours. So it's only appropriate that its customers enjoy access to some choice entertainment on those lengthy trips. KrisWorld, which Singapore boldly dubs "the world's best in-flight entertainment experience," is a remarkably well-stocked system with more than 1,000 choices on some flights, including everything from the usual offerings (movies, music, and TV) to more extraordinary features: On Boeing 777-300ERs and A380s, travelers can polish up their Arabic or Hindi with Berlitz Word Traveler, an interactive learning program that features lessons for 23 languages. 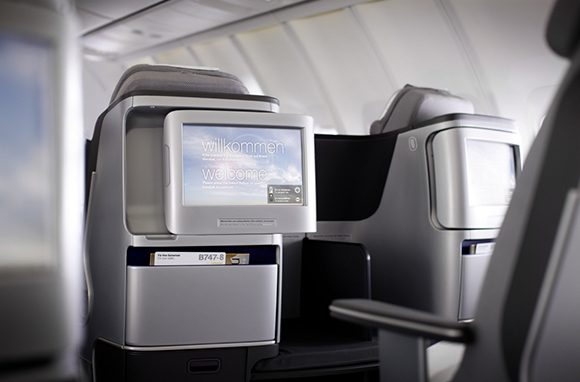 With free live TV, fast in-flight Wi-Fi, and free touch-screen seatback entertainment with a very good variety of offerings, Lufthansa's in-flight diversions make the grade. (Note, though, that Wi-Fi and live TV are only available on select flights, and Wi-Fi fees start at €10.95.) 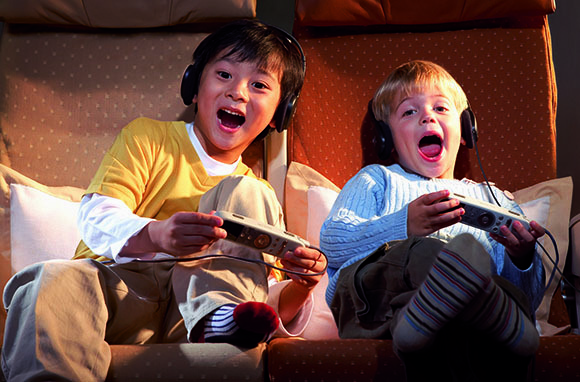 But what really stands out is the airline's special programming for younger flyers. Offerings on KidsFun, the German carrier's just-for-youngsters entertainment program, include child- and teen-friendly CDs and audiobooks, and even a special radio channel.